Today, I taught myself how to separate text in an Excel column into two columns with the Text To Columns function. This can be a huge time-saver when you have a lot of data to convert. I have a spreadsheet with student info…name, email address, etc. The first and last names were in one column separated with a comma. Well, I needed the names in separate columns, and discovered the Text to Columns function. Now, I would like to share it with you. It’s a good idea to create empty columns for your converted data to the right of the column holding the text you’d like to convert or split (first and last names for me). Then select the column you’d like to split and click Text to Columns on the Data tab on the Ribbon. When you click the Text to Columns command, the Convert Text to Column Wizard dialog box appears with a two choices…Delimited or Fixed width. Use Delimited if the text in the column is separated with a comma, tab, semicolon, or a space; and choose Fixed if the text is aligned in columns with spaces between each field. In the next step of the Wizard, you’ll choose the column format, like Text or General; and the destination column for your output. If you don’t choose a destination, the converted text will replace the original text in the column you selected earlier and flow into the column or columns to the right when you click Finish. It’s so easy and it works with Microsoft Excel 2007 or 2010 (Windows) and Excel 2011 (Mac). So cool! I need to use this function two times a year; so if I forget it, I’ll refer to this blog post to refresh my memory. And,you can do the same. I hope you found this Excel tip helpful. Post a comment if you have an Excel question for me! I am pleased to announce three recently-released Online Instructor-Led Courses offered this month. Each six-week course is facilitated by an instructor and is the perfect way to enhance a skill or learn a new one. I have learned SO much from the many online courses I’ve taken, and I think you will too! The August session begins Wednesday, August 15. To enroll, visit my Online Instruction Center at http://2educateyou.com/online-classes/, search for the course you want to take, and follow the enrollment instructions. This hands-on, project-oriented course is filled with easy-to-follow, detailed step-by-step instructions that teach you about editing photos and creating basic paintings. Discover how to improve photographs by removing flaws, correcting for poor exposure, or adding new elements using the newest techniques Photoshop CS6 can offer. You’ll even learn how much fun it can be to paint again, without the mess of cleaning up. And, best of all, you need no prior artistic ability or Photoshop experience to take this course. In this course, you’ll master techniques to make the most of your digital images and add a professional polish to your work. This course offers simple, step-by-step instructions for correcting flaws, enhancing the final product, adding text, and preparing images for email and the Web. Designed for those with no image-editing experience, this class will take you from novice to accomplished photo editor. Extend your Photoshop knowledge and learn how to enhance graphics by using layers, layer masks, and other advanced photo-editing features. You’ll learn non-destructive editing techniques that let you easily re-edit and change projects long after they were originally created. You’ll see how to use Smart Objects, so that even if you crop or resize an image, you’ll be able to get it back to its original size months afterwards. This course will teach you the building blocks you need to unleash your creativity! Click the File tab then click Recent from the menu. It’s as easy as that! 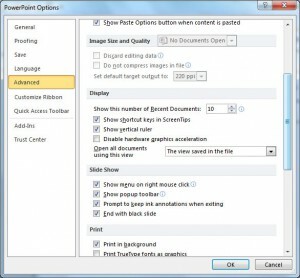 Removing a file from the list deletes the pointer to the file, not the actual file. 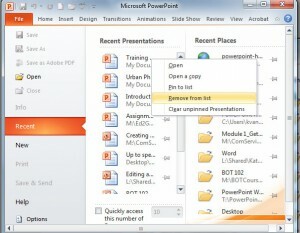 Click the PowerPoint 2007 Office button or PowerPoint 2010 File tab. Click the Advanced link and scroll to the Displaysection. Use the Show this number of Recent Documents spin arrows (up and down arrows) to change the value. The default value for PP 2007 is 17 documents, and 25 documents for PP 2010. If you have questions, please leave me a comment. I’d love to hear from you! This course will teach you how to use Photoshop with detailed, step-by-step instructions that you’ll have no trouble following—even if you’ve never used a computer for graphics before! Do you ever have the need to work with multiple programs at a time? It’s pretty common to do so; in fact, that’s one reason people purchase wide-screen monitors or work with multiple monitors at one time. 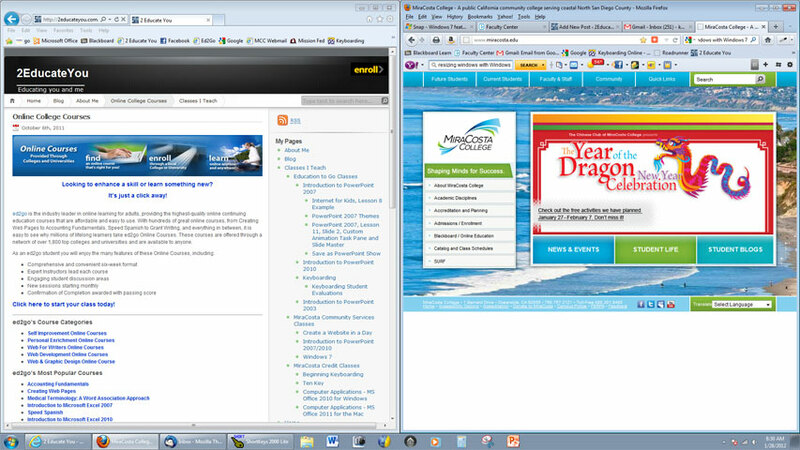 I love the Snap feature in Windows 7 that allows you to snap a window to the left or right side of the screen. I use the Snap feature a lot when I want to work with two windows (could be a program or a document) side by side. To snap a window to the left side of your screen, point to it’s title bar and drag it to the left. Once your mouse reaches the left side of the screen, the window is snapped into place, taking up half your screen space. When positioning your mouse to drag, I suggest you place it as far left as possible on the title bar so you don’t have to drag far. Use the same procedure to snap a window to the right side of your screen, except point your mouse on the right side of the window’s title bar and drag to the right. When the window snaps to the right, you’ll have two equally-sized windows side by side. Here’s an example of two snapped windows.